There is a book fair at the moment till 20th January at Mubarak Library. Most of the books are in Arabic but there are some cooking books and children's books in English. 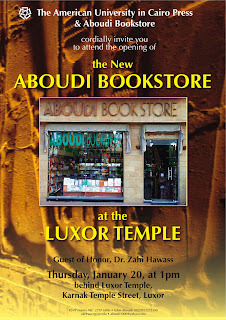 On 20th January, the official opening of the New Aboudi Bookstore, behind Luxor Temple – next to McDonald’s . The American University in Cairo Press and Aboudi Bookstore are organising this event and hosting Dr. Zahi Hawass as the guest of honour. 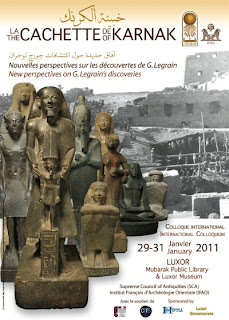 On 29th January, Institute Français d’Archeologie Orientale(IFAO) and Supreme Council of Antiquities are organising the International Colloquium on The Cachette of Karnak ( New perspective on G.LEgrain’s discoveries). The colloquium will be hosted at Mubarak library and Luxor Museum.